Cameras line the store's ceiling, tracking your every movement. But does it work as billed — the world's first cashier-free shop? 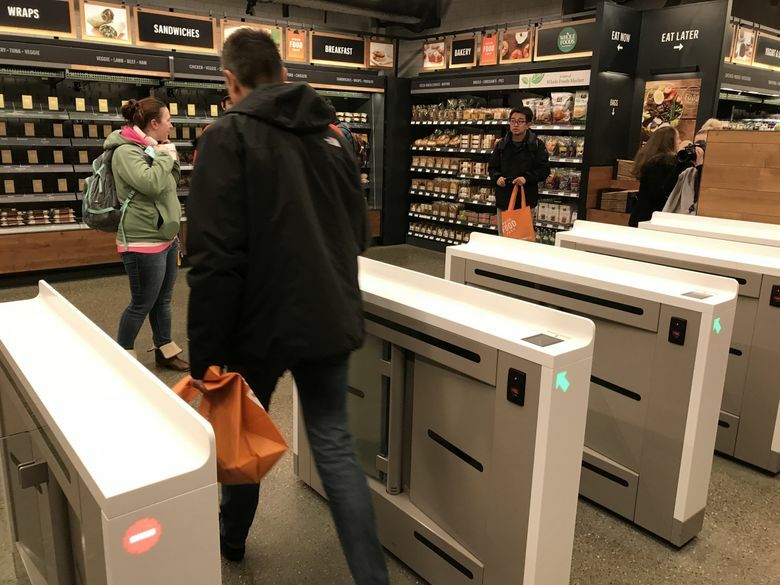 We just checked out Seattle’s cashierless Amazon Go convenience store — and it was about as easy and painless as promised. 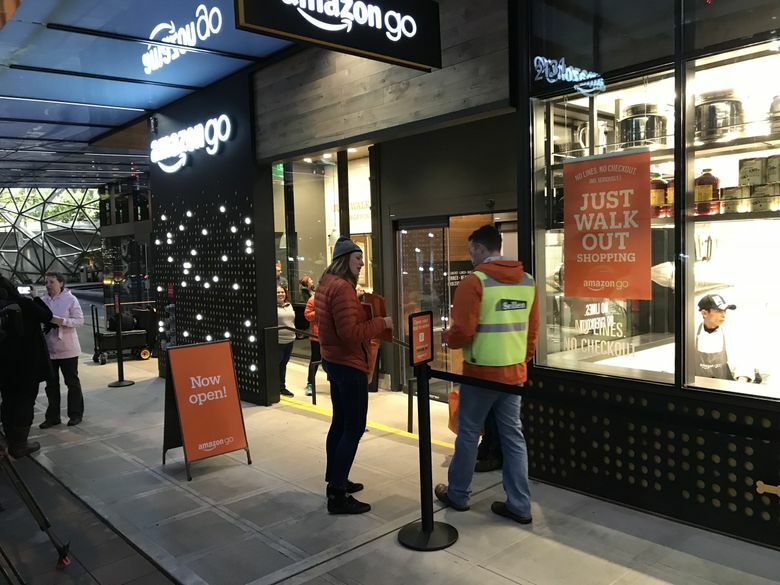 This prototype convenience store, billed as the first cashier-free shop in the world, has been open to Amazonians for about a year at Blanchard Street and Seventh Avenue. But on Monday, the store was open to the general public for the first time, and folks were lined up long before the 7 a.m. opening. 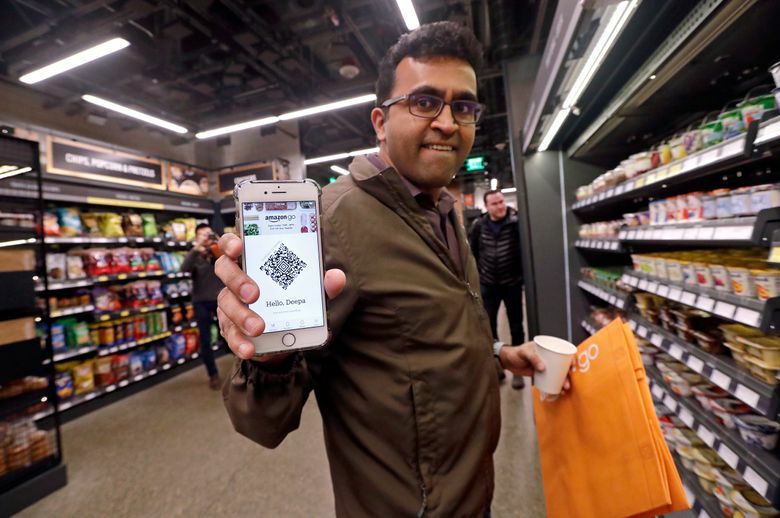 First, you have to download the Amazon Go app and scan your unique code to let yourself in. After that, it’s pretty much a natural grab-and-go experience. The 1,800-square-foot store is stocked with the usual convenience-store items: candies, cookies, bagels, chips, sodas, milk, cheese and trail mix, among other snacks. Also on the shelves are sandwiches and meals, made fresh in the window-lined kitchen at the front of the store and just below street level. 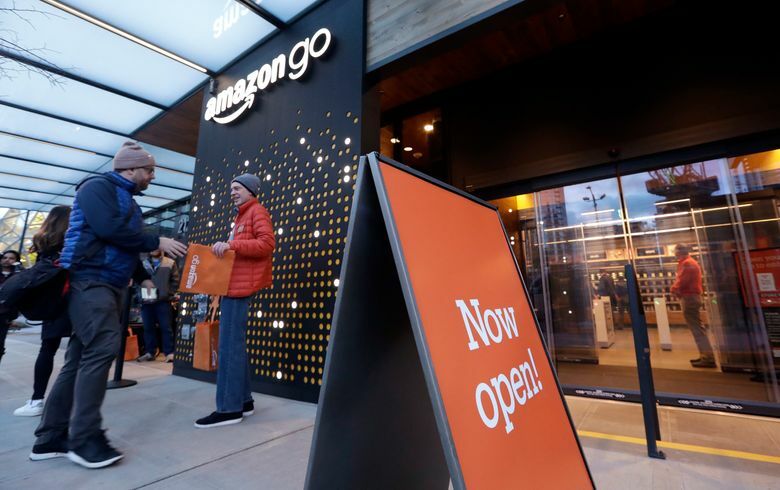 The cashierless and line-free experience is made possible by “highly accurate” sensors and cameras that line the store’s ceiling, keeping tabs on each customer and what they are taking off the shelves, according to an on-site Amazon spokesperson. If you change your mind and put something back, the sensors can tell. Nick Frantsevich said shopping there was a fun and “unusual” experience that felt just a little like shoplifting. He noted the lack of cashiers, and not even one self-checkout machine. “I took this and walked out,” he said, holding up a box of sweets. Susan Huntington said curiosity drove her and her family to investigate the store on its public opening day. “We live nearby, so we’ve been waiting for this to open,” she said. Huntington said the food looked nice and fresh and the chocolate croissant she picked up looked tasty, but prices were a little too high for her to use the store on a regular basis. 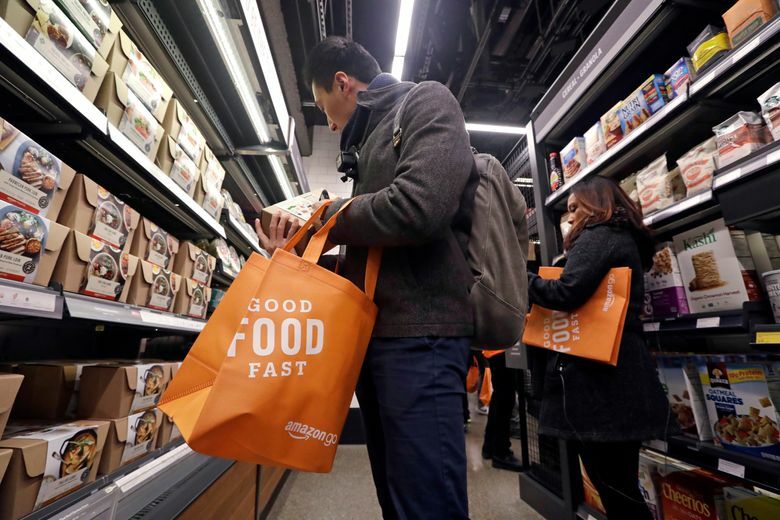 “They’re too high for me to shop here on a daily basis, but I can see how it would be attractive to a younger grab-and-go generation,” she said. The app, in which you sign in to your Amazon account, keeps track of your items and tallies your receipt automatically. It took about 15 minutes for the receipt to show up after I’d left the store, but it was accurate: coffee creamer for The Seattle Times’ morning news crew and Pocky chocolate covered biscuits, which I used to have to go to Uwajimaya to get.